Propsummit.com a Blade Runner Prop Community Forum BladeRunnerProps.comView topic - Armament on the Nostromo? Posted: Sat Apr 13, 2013 12:33 am Post subject: Armament on the Nostromo? Or some sort of tow cable cannon? Interesting! I put my vote in for tail gun because I think the thrusters would burn a tow cable to a crisp when fired up. I love geeking out about this stuff. Perhaps...and if memory serves, the Nostromo did start out as a military vessel. But that thing looks like a pop gun, I would think that anything that might conceivably prove to be a threat to a vessel Nostromo's size would need air-to-air missiles (pardon me...space-to-space lol), not just a spud gun. Then AGAIN...any perforation of the hull of a space-bound vessel would be of some real concern. My Feeling is that it is another miss-step by those who restored the model. Whatever it is, it doesn't appear to be a fixed device. 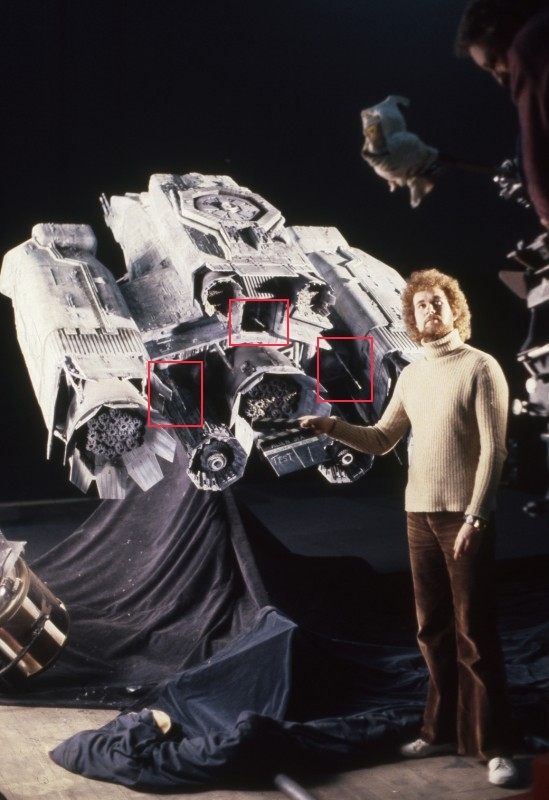 In the picture you supplied, it seems to be pointed toward the starboard side of the craft, yet in a shot in Alien, it is aimed toward the Port side. It could be a steerable antenna, who knows. When Ripley goes to see what options Muthur might be able to give them, doesn't the screen display of various ship functions include - amongst the many headings - one for armament? Can't remember exactly what it says about the subject though, if it does at all. You may have seen alignment, perhaps? I see now, I was thinking "Armament" but the word actually used is "Martial" - so that poses the question, ship's weapon systems or crew's? Both? I have to admit I had no idea there was a back story covering the ship's history. Certainly hadn't read or heard anything (before discovering this forum ) that said it was a military transport before becoming a Deep Space Tow. So as that's apparently the case do you assume the weapon systems mounted on the ship were deactivated and removed when it was transferred to civilian use? Or maybe some systems are retained. There's no reason to assume piracy doesn't occur in the future. Have to say, a military version of the ship would be an interesting CGI model to explore, especially if you included large hangars etc. Oh how I wish I could actually use Blender properly. Merchant ships in WW2 carried their one big gun(usually a 5 inch) aft.They usually had several other light AA weapons.Might well be armament in the Alien universe is necessary for commercial ships(as it was for centuries on Earth).As defense against pirates.